Preheat your oven to 425. Drizzle olive oil over the salmon and season with salt and pepper. 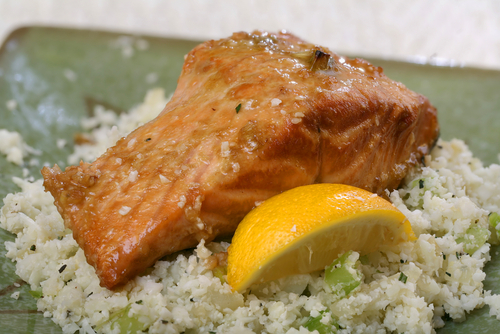 Place the salmon on a foil-lined baking sheet and bake for 15-18 minutes. Make sure the center is solid in color and completely cooked. While the salmon is cooking: Heat a large skillet over medium heat with olive oil. Add minced garlic and diced onion and saute until the onions are clear in color. Add in the riced cauliflower, mushrooms and peppers. Add chicken bouillon paste or broth (preferred due to the lack of sodium). Cook thoroughly and cover for 10-12 minutes (stirring occasionally) until the cauliflower rice is tender and cooked. Divide the rice among two bowls and serve each with a little salmon filet. Enjoy! I think you must really want to eat this meal as the calorie count is almost half of the daily allotment, that seems super high to me? Made this dish, but had to modify it a bit; added carrots instead of mushrooms, water instead of chicken broth, and Goya spice packet. Very tastey. I told my son that it was rice, never mentioned cauliflower. He thought it was good.